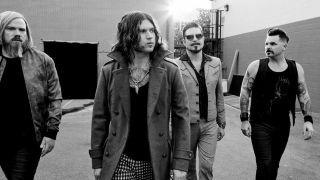 Rival Sons have launched a video for Do Your Worst, the first track to be released from their forthcoming album. The as-yet-untitled collection is due early next year, and will be released on the Atlantic Records imprint Low Country Sound, a label launched by longtime Rival Sons producer Dave Cobb. The album was recorded with Cobb at the historic RCA Studio A in Nashville, and at the legendary Muscle Shoals Sound Studio in Alabama. “Sometimes environment really shapes a song," says singer Jay Buchanan. "Hunkered down in a threadbare shack deep in the south Tennessee woods we (Scott [guitarist Scott Holiday] and I) sweated it out and just wrote for a week straight. More details on the album, the band's sixth, will be announced over the coming weeks.